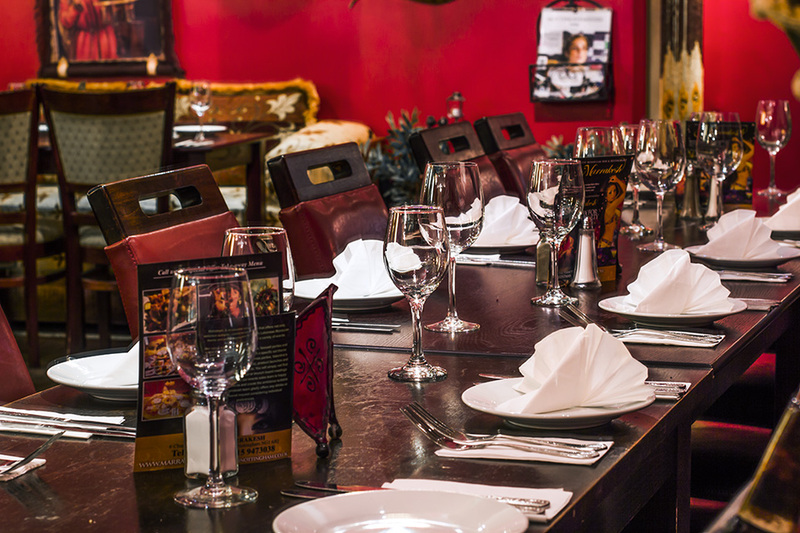 Available for parties of 2+ the charcoal grill set menu offers a fantastic selection of hot and cold starters, followed by one of the restaurants most popular grilled dishes finished off with dessert for just £29.95 per person! A vegetarian option is also available for the same price. 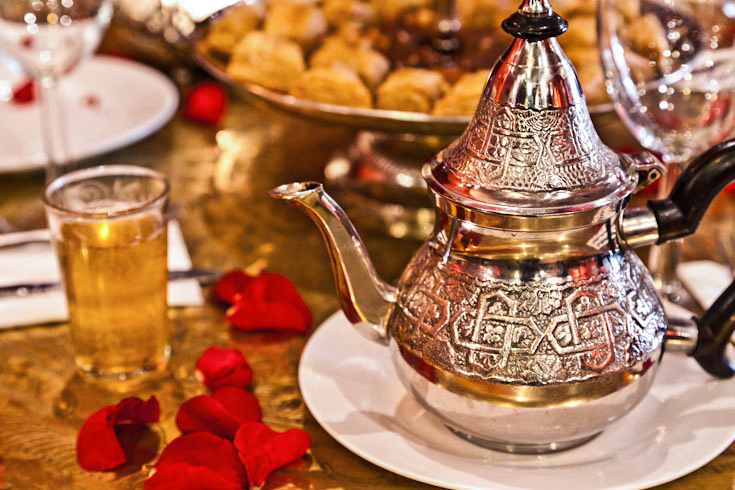 It's perfect for those looking to sample a little of everything that Marrakesh has to offer. Please note this menu is available in the evenings only. Book online for free text confirmation or call 0115 754 0716. Available for parties of 2+ the Marrakesh mezze set menu offers a fantastic selection of hot and cold mezze dishes for just £24.95 per person! A vegetarian option is also available for the same price. It's perfect for those looking to sample a little of everything that Marrakesh has to offer. Please note this menu is available in the evenings only. Book online for free text confirmation or call 0115 754 0716. 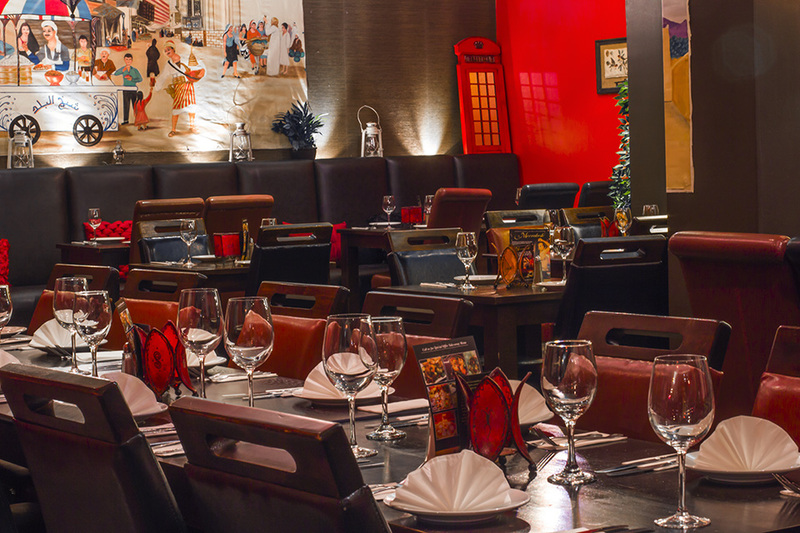 Available from 12pm-3pm the Moroccan lunch menu offers a choice of two mezze dishes followed by one of their mouth-watering main courses for just £14.95 per person! Please note this offer is only available during lunch service. Book online for free text confirmation or call 0115 754 0716. Available from 12pm-3pm the Lebanese lunch menu offers a choice of two mezze dishes followed by one of their delicious main courses for just £12.95 per person! Please note this offer is only available during lunch service. Book online for free text confirmation or call 0115 754 0716. Available from 12pm-3pm the seafood lunch menu offers a choice of two mezze dishes followed by their signature whole seabass for just £14.95 per person! Please note this offer is only available during lunch service. Book online for free text confirmation or call 0115 754 0716. Celebrated a family birthday and had a very good meal. The starters were amazing. Hadn't been to Marrakesh for a while and amount of main dishes to choose from have been reduced. Spicing in my lamb tagine was underwhelming. Food would be better if it was warmer, service was long wait and we pre order. Very friendly staff in particular the Spanish and Portuguese girl, “sorry girls I never catch your names“. Excellent meal, wonderful ambience... especially on a wet chilly November evening. Felt transported out of Nottingham and back to being on holiday. The food was beautifully presented and the fragrant spiciest were well balanced. As always, wonderful food, atmosphere and great service. The overall meal was excellent, vegetarian choices were very good. We all definitely ate too much!, but sure we'll be back again. Great food, really amazing atmosphere including the dancer. The service was disorganised and sloppy, though could be improved. The waitress herself was lovely. Really amazing evening, will definitely be coming again and recommending to others. The staff, when we got their attention were lovely but they seemed to forget us regularly. The starters were gorgeous but unfortunately the mains disappointed. My prawns were overdone and cool in places and my husbands lamb had a strong overriding flavour which was too strong. Atmosphere is fun and lively though. Next time we’ll order the Mezze option! As always, really fantastic meal. Hats off to the waitress for putting up with our large party and and serving us all with a fun attitude. The belly dancer was brilliant also. A wonderful evening. Absolutely fantastic night at Marrakesh - food was amazing! Went as a party of 4 and had a great evening, we all had the charcoal grill set menu which gave us a chance to try lots of different dishes. Each one was delicious and the staff very helpful at explaining what they were. Beautiful decor and reasonably priced. Would definitely recommend. Great food and entertainment is top notch! Have always had a good meal and good time at Marrakesh Restaurant. The food is really tasty and really good portion sizes. The menu is interesting and there are a lot of options. Belly dancing makes it fun too! Second visit to Marrakesh and we were not disappointed. Went with some family and they thoroughly enjoyed it. The food was excellent. Great portion sizes which is great for sharing and trying new dishes. Even the little one enjoyed herself. Would highly recommend for any occasion. Service was excellent all the way through. Very friendly service. Starters were delicious, main courses ok. Chicken couscous a little dry, and short on veg. Bit cold due to excessive air conditioning. I had steak which was cooked to perfection. The entertainment too was very enjoyable. Very nice meal at Marrakesh indeed! Great value great atmosphere! Deffo be back again! Marrakesh is a restaurant with a difference! 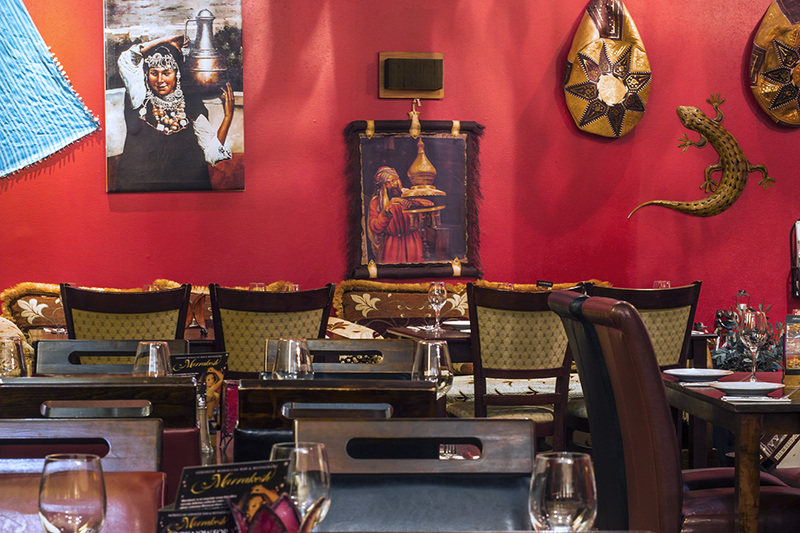 Exotic smells and decor greet diners, the food offering is Moroccan and Middle East influenced. My Chicken Tagine is definitely a winner and great value. No-one goes away hungry! Great fresh tasting authentic Morrocan cuisine. Really enjoyable. Nice ambience and helpful friendly staff. A really good evening, food great, (recommend the lamb tagine), service spot on and the belly dancer spectacular at Marrakesh! Good food, great entertain too, didnt realise there was a dancer. Would go again. Fabulous evening of excellent food and a belly dancing show...exceptional ! 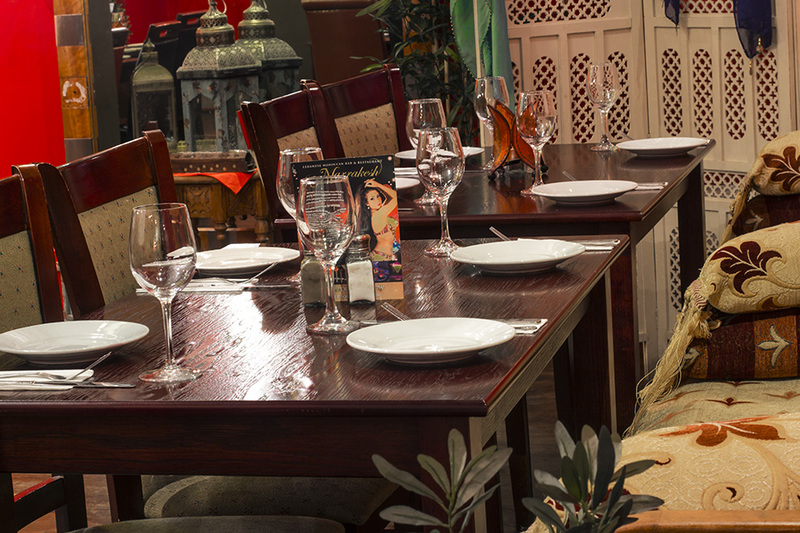 An exotic restaurant with smells and sounds of N. Africa. The staff come from many assorted countries but work well as a team and give good service, the manager especially looking after his customers. We felt valued and enjoyed the whole experience. We shall be returning soon! We visited Marrakesh on a Saturday night for dinner. Although the food was well prepared it was a little expensive for what we received. I was expecting many different flavours and lots of spices but in the end it seemed a little bland. Unfortunately the music in the restaurant was very loud, only to be increased in volume when the belly dancer turned up. Very hard to have a normal conversation. I would return but probably with a large group of friends. Excellent meal, large portions though. Very tasty. Enjoyed the belly dancing. Staff really friendly. Excellent food and great value. Staff very attentive. Would highly recommend. Lovely food at Marrakesh. Great atmosphere. Friendly staff. Loads of character. We really enjoyed the food the service & the overall evening at Marrakesh in Nottingham. Marrakesh is definitely worth a shout. The food was amazing, which I think is particularly due to there being little choice on the menu but there will be something on the menu you like! The visit was slightly disappointing as the service was very slow (even on a Monday) but the quality of food did make up for this. Enjoyable meal on a busy Saturday night. The only downside was the background music being too loud to hear conversation from across the table, could have been the position of our table to the speaker, although didn't spoil the evening. Another good evening at Marrakesh, didn't like being seated by the kitchen in an empty restaurant but once it was sorted by moving to a better table with any fuss it was business as usual. Authentic food with some great deals to be had, especially at lunchtime. As usual this place is great! Lovely food, great service and the entertainment, Belly dancing, is amazing! 2nd visit, this time mid week. Enjoyed as much as the first time if not more. I like this style of food and will return. The restaurant was fairly quiet the night we dined - service and food was excellent, the staff were friencely and helpful - we will be back the next time we are in Nottingham. Pleasant evening spent at Marrakesh. What a lovely restaurant, staff really helpful and attentive plus the food was superb at Marrakesh. Value for money was brilliant we had the Mezze menu and there was loads of food for us all. There was 9 of us and there were no complaints at all. Lovely, different food and good service at Marrakesh (Nottingham). The restaurant is quite big & loses a bit of charm in the back room, though decor is nice and the staff very friendly. This was our first visit to Marrakesh. The meal was a success from start to finish. The food was delicious and the staff were very attentive. Definitely worth a visit if you are in Nottingham. Amazing food. Fantastic balance of dishes and meat as tender as can be. The detailed attention to the food is noticeable even in the simplest parsley salad which was dressed to perfection, and an incredibly fragrant rice, whose job was to merely to accompany the last course of barbecued tender morsels of chicken. The house wine was good, the orange juice was fresh and the service was impeccably attentive without being intrusive. We will return, and I would highly recommend it. Great food - the Marrakesh is well worth a visit! Great food at Marrakesh (Nottingham), a chance to try something different, good service, next time I would choose a table in the main body of the restaurant as felt a bit cut off in the corner next to the kitchen. A small grumble for a very agreeable evening however. Went for the Moroccan lunch offer and had lamb tagine for mains. Unfortunately it was too overspiced for my liking, however, the couscous was cooked perfectly and the flat bread and houmous starter was great. Will go back and try something else on the menu. Food & service excellent for all 5 of us. Only 1 complaint, the music when the belly dancer came on was deafening (impossible to hear ourselves talk) & she came on twice! A nice and chilled place but we was in at 4pm so fairly early for evening meals... We ordered Lamb Tagine and Royal Couscous, let me say the Royal Couscous was amazing and I eat big so value for money was fantastic! The Lamb Tagine was cooked perfect and the taste was out of this world. Overall this was a great meal experience and I will certainly recommend it to anyone. Staff were amazing, I had informed the staff that my mother was fasting and the staff were so tentative. They brought her water and dates ready for when she could break her fast. The food was lovely, but it wasnt as spicy/flavourful as I expected which was a little dissapointing but it was still really nice. Decor is awesome and the shisha is one of the nicest Ive ever had. Great food, excellent value for money, good service and a great atmosphere. Another excellent meal at Marrakech. Food amazing, entertainment brilliant, ambiance exotic. Excellent service, menu explained well. Only criticism was the pungent aroma from the joss sticks/incense burner which really was overpowering and started to irritate our throats. Amazing food and service, one of the best dining experiences I've ever had. The atmosphere was fantastic, will definitely be returning to Marrakesh restaurant. Good food. Good service. Will go again! Great food Mezze Menu is ace and there is loads of it! Entertainment while eating was brilliant no issues with anything! I think all in our party of 7 enjoyed the restaurant and its food. Our waitress was very efficient and friendly and helpfully guided us as to the right amount of food we should order. Our selection of 3 mezzes to share plus a main course each suited us perfectly. The food was tasty and interesting and the mezze selection had plenty of variety. There is an interesting wine list, including good examples of wine from Morocco itself and the Lebanon - very good accompaniment to the food. This place is certainly worth a visit and is refreshingly different from the usual run of pasta/pizza/texmex offerings in Nottingham. Atmosphere is great and authentic. Had set menu which was a good way to try various starters but when we revisit we will choose of the main menu as the choice of main courses were more appealing to us. Overall a great evening and will recommend. First time visit to Marrakesh restaurant. We really enjoyed it and will be returning. Shared the MEZE and there was more than enough for us. Lovely food and lovely restaurant. An excellent meal, unfortunately we were seated with all the big parties & was a very noisy, making it difficult to talk. I went here with my daughter and her boyfriend. The service was prompt and the staff friendly and helpful. The food was good and portions were ample. The belly dancer was entertaining but the music was a bit too loud, sometimes making conversation difficult. I would definitely go again but please turn the music down a bit! First time eating this type of food and I am going back again to try more! Had the Mezze menu and got to taste a bit of everything which did not disappoint. We had the set menu and the food was fantastic. The service was a little slow as we had to remind the waitress we had ordered a bottle of wine and we also had to ask where our starters were as we had been waiting ages. Overall great food would go back if the service improved. An excellent night, really enjoyed the food, the atmosphere & the belly dancer, however the service was very slow, which let them down. The resturant was a brilliant experience for lunch. Food is delicous and well presented, with generous portions. Beautiful furniture and wonderful scents also candles. Really enjoyed our first time at the Marrakesh and would definitely go there again. Staff were really nice and friendly. Food was excellent and there was belly dancing! I went to Marrakesh with my girlfriend and had a really good night. We had a few starters including hummus and some spicy potato thing that was really nice. For main I had the amazing mixed grill and my girlfriend had the tagine - both well worth a try! Desserts were nice - just some small pastries washed down with wine. Well worth a try if you've not been before. Also should mention how polite and friendly all the staff were. I needed somewhere to seat a large group of 18 and I'm so glad I chose Marrakesh. We all ordered from one of the set menus and there was plenty of food to go around. We weren't rushed and the staff were really lovely to us throughout the evening. I would definitely book here again for a group event. 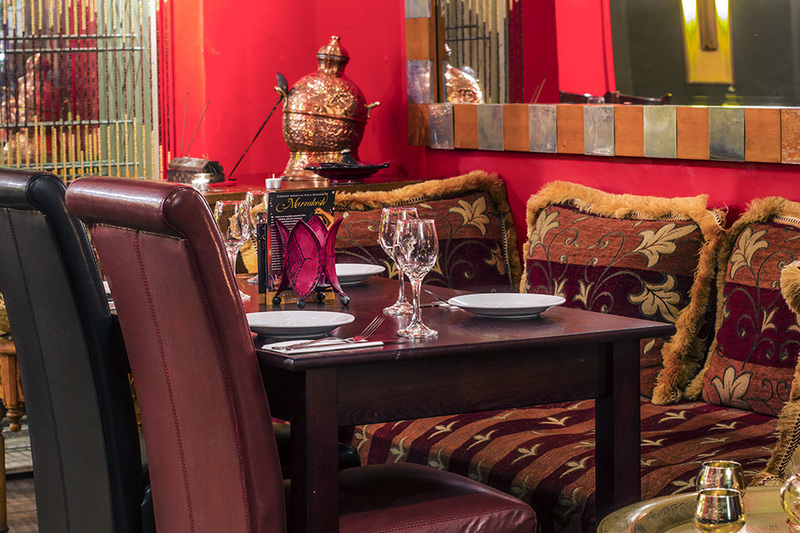 Marrakesh is a Moroccan and Lebanese restaurant in Nottingham city centre. Located in the Chapel Quarter of the city, just a short walk from Market Square and along the same stretch as venues such as Tonic, Chennai and Sinatra’s, Marrakesh is a convenient and vibrant place to relax, drink, dine, and on the weekends, dance! Marrakesh offers its guests a highly authentic Moroccan dining experience that puts the fun back into grown-up dining out. Guests are able to decide whether they would like the full experience by sitting at one of the lower tables with cushions instead of chairs or dine from the normal tables that range from sizes suitable for couples all the way to ones suitable for large parties including corporate events and special occasions. The atmosphere is lively and welcoming; from the moment you step through the door you are looked after by the friendly and helpful staff. On Saturdays the atmosphere moves up a gear as entertainment is provided by a professional belly-dancer. 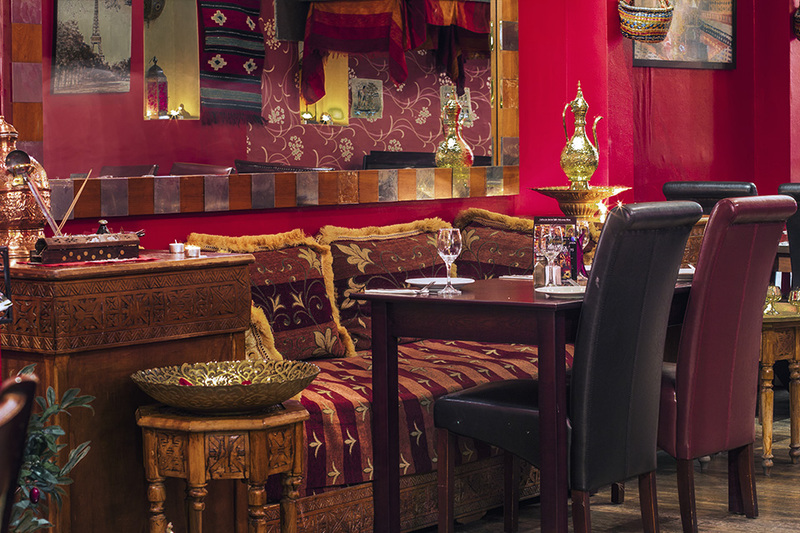 The food on offer at Marrakesh is a combination of authentic Moroccan and traditional Lebanese cuisine with many instantly recognisable dishes such as lamb kofta and the signature tagines. 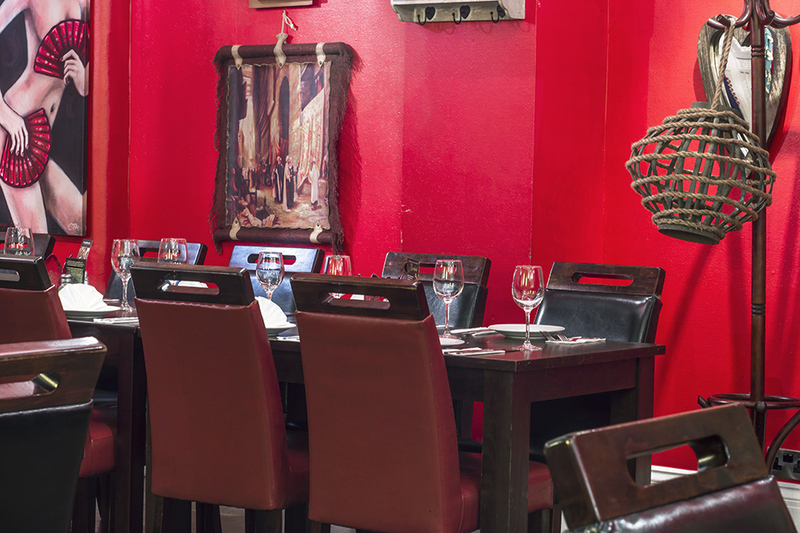 With a good selection of vegetarian options, a wide variety of value for money set menus and special diets catered for upon prior request, Marrakesh accommodates all tastes, preferences and budgets, resulting in a fantastic meal out for all. Some of the more popular dishes on the menu include the chicken tagine lightly seasoned with Moroccan spices, preserved lemons, potatoes and green olives served with steamed couscous; the whole seabass marinated in olive oil, garlic and herbs and topped with tahini sauce; and the classic lamb kofta grilled on skewers with peppers and parsley. Marrakesh Moroccan bar and restaurant in Nottingham is a unique venue that offers locals and visitors a taste of Morocco (minus the pricey flights!). 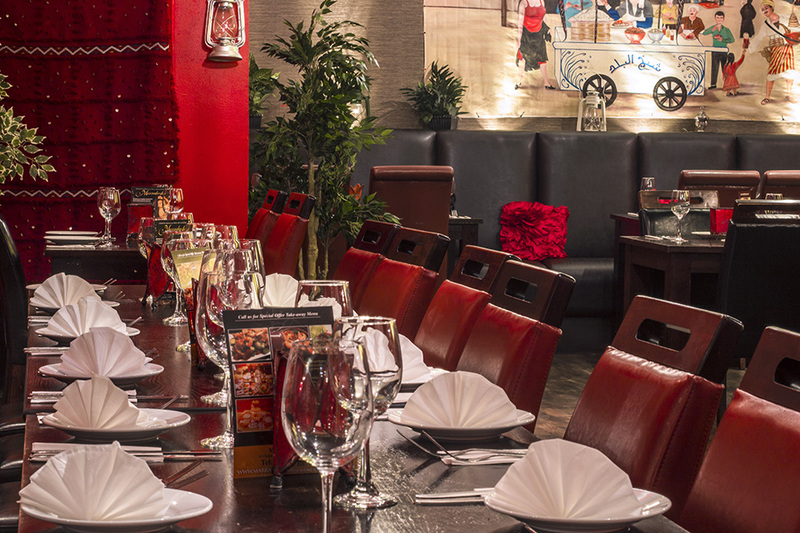 The lively atmosphere lends the restaurant perfectly to all occasions, from corporate parties to family gatherings, dinner dates and quick, tasty lunches. Your choice of a dish from either 'From The Grill' menu or 'Marrakesh Speciality' menu. Excluding Couscous Royal and Mixed Grill Fish.